Known as the ‘first independent state of the millennium,’ the island nation of East Timor will celebrate four years of independence on May 20th. Since 2004 – nearly half the young country’s life - Cuba has had a medical cooperation program with East Timor that was recently expanded to include a greater presence of Cuban doctors in-country and additional medical scholarships for East Timorese students. 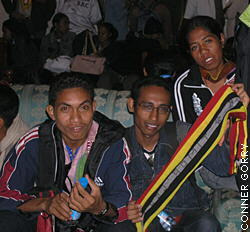 East Timor pre-med students Aleito Menezes, Délio da Silva and María Geremias en route to Havana. Creating a sustainable health system where East Timorese provide health services for their own is the long-term strategy, says Dr. Francisco Medina, head of Cuba’s Comprehensive Health Program in the small island nation. There are currently 182 Cuban professionals and technicians working in East Timor under the medical cooperation project. “We’re the first to get rid of the desk separating doctors from their patients, and many times the first to see them not just as cases, but as human beings,” Dr. Medina told MEDICC Review. This humanist approach is the philosophy underscoring medical education in Cuba and is the foundation for East Timor’s future doctors.